The New Age belief is that the crystals attract negative energy from the wearer or channel good energy to them. The crystals are used to collect the negative energy that either they give off or someone gave to them. It absorbs this energy, transferring it from the person and this negative energy then needs to be cleansed in salt water. Crystals also are believed to help channel the power in the air to the wearer. They are placed on particular energy points (chakra's). The person may meditate with it, which helps channel the power to the wearer. Medical Practices of many ancient cultures included wearing talismans and amulets around the neck were used for cleansing. Specific stones were worn to bring healing for an ailment. Crystals have become a billion dollar industry. Crystals can be used in natural settings but once we use them for spiritual means (such as healing) it is a New Age practice. They sell usually for $5 to $20 and some up to $10,000 or more. There are many different types of stones that are used in the occult for healing and transformation. Stones have a history of being powerful objects in the hands of wizards, witches, shamans, and others who practice the mystic arts. Crystal work is a bridge to both ancient and modern shamanism. This was part of the medical treatment in pagan religions. In native American healing, the shamans will utilize stones as a method of both diagnosis and treatment; the crystal is believed to be a vehicle through which the healing nature spirits work. Those who read of the occult and psychic phenomenon find such men like Edgar Cayce recommending to use gems and amulets. In occult history much is written of legendary civilizations with advanced sciences that used crystal power for many physical and practical purposes, as well as healing. The Pyramid in Egypt was supposedly once capped with a giant crystal on top to assist in the utilization of channeling cosmic forces. It is taught that the legendary continent of Atlantis was destroyed was because sacred knowledge was abused and the power misused. Before Atlantis was destroyed, the wise uncorrupted ones had preserved the knowledge the higher race had achieved. They did not want to risk transcribing this knowledge into books and risk they're being lost by the earth's cataclysmic changes. So they programmed certain crystals with the information and rematerialized them into the earth. Mythological stories abound about mankind's ancient past, yet the energies that are manipulated through gems are quite ancient, but they are completely unverified by our science of our day. We find that they have everything to do with the Occult. The power of talisman in precious stones is associated historically with astrology: "The influence over human fortunes ascribed by astrology to the heavenly bodies is conceived to be strengthened by wearing the gem appropriate to certain planets or signs, for a subtle emanation has passed into the stone and radiates from it" (85:339: Can you trust your Doctor by John Ankerberg and John Weldon). There have been religious superstitions in history Kings in ancient India were advised to collect the very best gems to protect themselves from harm. (We see this portrayed still in the movies or comics where men search for stones of power and influence) Ancient works on astrology, written in Sanskrit ( 400 BC.) describe the Power of stones. In those days astrologers advised people struck with misfortune to wear different kinds of stones to counteract the negative effect of the planets. For example in Astrological trinities ...Green, rose, quartz has the astrological sign of Taurus and develops love. Amethyst is related to Pisces and the third eye it helps surrender ones mind to their higher self. the color Black in Obsidian is related to the sigh Scorpio and the planet Pluto, it awakens dormant unmanifested potential. As with all of the occult systems they are interconnected to the Zodiac and have hidden powers for healing the body as well as the emotions and spirit. 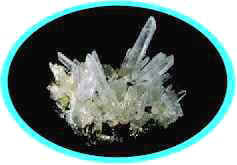 You will find that nearly all agree there is a spiritual power a connection to the spirit world as one uses the crystals. Kundalini energy is often awakened when you start working with crystals. You will need to know how to channel this in yourself, to utilize the unleashed energies and powers and learn how to create this in others. There are chakra systems or energy matrixes in the body that become activated as you work, and these can be activated in those you work with. Because the work you will be doing is on the subtle planes, you will need to know about the astral and mental planes, and how to work with them . . . . Because you begin drawing tremendous forces of energy through your body as you work . . . you will need to expand your consciousness beyond your physical body, beyond the environment and into other [spirit] realms. As the kundalini rises, different powers tend to develop. These can help you in your crystal work .... These powers tend to be those of clairvoyance, clairaudience, psychic healing abilities, astral projection . . . (82:74) ( referenced Can you trust your Doctor by John Ankerberg and John Weldon p.246). Silbey herself confesses that "after some time of working with the crystals, you may find that you can do without them just as effectively. Don't be afraid to let go" (82:5). The crystal practitioner can become a channel or medium and receive information from the spirit world. most would agree that one is opened up to a whole new world and a way of learning information (HIGHER CONSCIOUSNESS). these energies are really spirits that convince people by exhibiting power. Crystals also help identify those in the New Age Movement, although not everyone who wears a crystal is doing so for this reason. Many point to the Bible, that a breast plate made of twelve precious jewels (Urim and Thummim?) combined specifically together in four rows of three, and worn over the heart would endow Aaron with knowing the will of God. Interestingly Satan had crystals too, being a priest of the angels. Ezek. 28:14 "You were the anointed cherub who covers; Ezek. 28:13 "You were in Eden, the garden of God; every precious stone was your covering: the sardius, topaz, and diamond, Beryl, onyx, and jasper, sapphire, turquoise, and emerald with gold. The workmanship of your timbrels and pipes was prepared for you on the day you were created. We are also told that this angel Stan is beautiful creature who has power beyond ordinary men and can do miracles. He can do this by using different belief systems that are attached to the occult arts. The bible mentions- Ezek. 1:22 "The likeness of the firmament above the heads of the living creatures was like the color of an awesome crystal, stretched out over their heads." In the Bible Heavens sea is like crystal. Rev. 4:6 "Before the throne there was a sea of glass, like crystal. And in the midst of the throne, and around the throne, were four living creatures full of eyes in front and in back. " The Heavenly city (the New Jerusalem) Rev. 21:11 "having the glory of God. Her light was like a most precious stone, like a jasper stone, clear as crystal." Rev. 22:1 "and he showed me a pure river of water of life, clear as crystal, proceeding from the throne of God and of the Lamb." New age crystal healing is a minor variation upon ancient occultic themes from different cultures. Throughout history, these items have been associated with the spirit world, and because of this, are believed to possess magical abilities. This is why metaphysical traditions from East to West use these magical stones to assist in their occult work. Here are only a few examples from the book Crystal Enlightenment Selenite "white is the color vibration associated with the crown chakra (the occult system of energy centers in the body)...is an important contributing member of the mineral kingdom and can be used as a touchstone for mental clarity and for developing telepathic Powers, as well as appreciated for its inherent beauty" (Crystal Enlightenment by Katrina Raphaell p.151). Sodalite is one of the awakeners of the third eye which prepares the mind to receive the inner sight and intuitive knowledge...This is a good stone to carry, hold, meditate with or place upon the third eye area to gain intellectual understanding of one's self or a situation. (Crystal Enlightenment by Katrina Raphaell, p.153). I am Malachite, the green fire, septor of the fourth ray. I am the dragon, satan fear, the lizard, the serpent, the frog, the dense; you know me in your modest dreams. I am the wheel, the hub-the unfolding universe. I am the black void, density in manifestation. I am the womb of creation. There is no part of your body that remains untouched by me, for I am creativity, the essence of alterability within you. My mask is blackness, my purpose is creation, I am the womb, the mystic pool. Do not seek in total to understand me, my essence is unfathomable. I am the deepest yearning in your heart, the deepest fear in your mind, the ultimate process of experience-CREATION. What needs to be answered is what the real source of power behind New Age crystal healing and crystal work? If one were to ask those who use it in the past, it would be the same source of power today, the spirit world. Most crystal healers believe that the crystals themselves contain magical (spiritual) powers. The truth is that the crystals have no power in and of itself but are merely vehicles through which spirits may choose to work to open up the participant and enhance spirit contact. At best this is all superstition, at worst it can be an open door to the spirit realm which we are forbidden to seek and certainly not equipped to traffic in. Like any occult practice it can be dangerous.